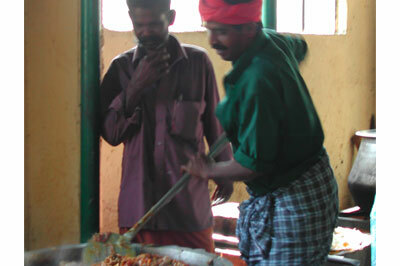 As a missionary, Matthew Thomas became burdened to start a camp for the young people of India and contacted CampsAbroad at the urging of Evangelist Tom Farrell. 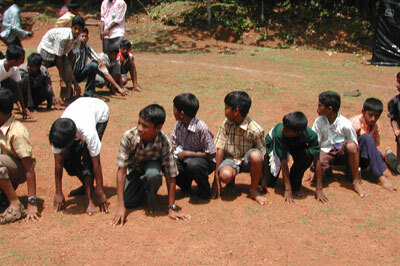 A team helped start the camp in 2000 and returned in 2001. Contact was maintained through the following years and a group returned in 2005 to help transition to a new camp director, Santhosh George, Matthew Thomas’ son-in-law. 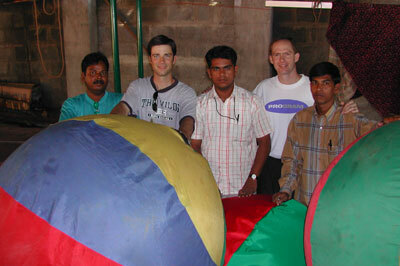 In March 2011, CampsAbroad sent the team of Dan Brooks, Joel Albright, and Kevin Moses to assist Santhosh and Sophie George with their staff training and a full week of camp. Brother Matthew Thomas is a modern-day apostle Paul. Saved at South Sheridan Baptist Church after bus workers invited his family to church, he later gave up a well-paying job to return to his people in India at the age of 53 in 1988. 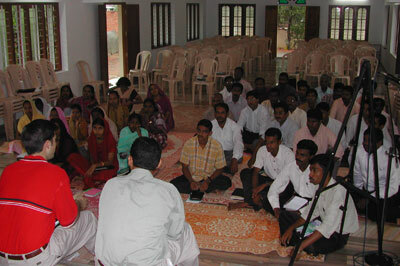 The Lord has used him and his wife, Sarah, to start 17 local churches. It was a privilege to go to Karala eleven years after Matt and Kelly Collier first went to help missionary Mathew Thomas establish a new camp ministry in India. How thrilling it was to see this once-a-year camp still operating on the same philosophy of ministry that was taught back in 2000. 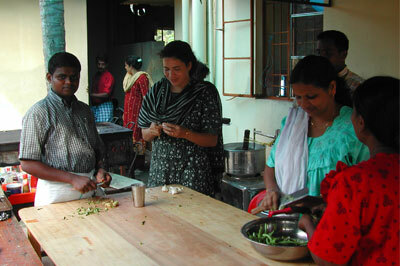 Matthew Thomas continues to minister faithfully and is still very burdened for a permanent camp in the city of Kochi. He knows that will only be possible through the leadership of his son-in-law, Santhosh, together with his daughter Sophie. 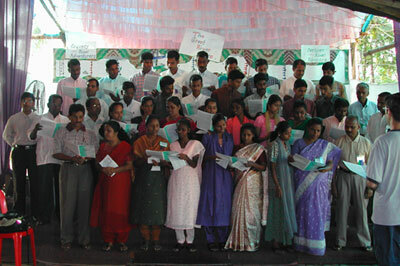 Seventeen churches have been started and continue to work together with the camp ministry. 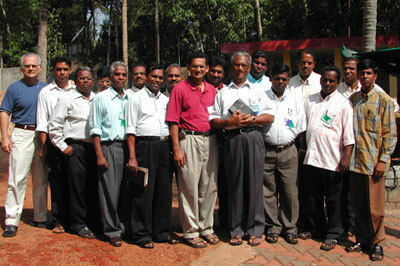 Many of the pastors of those churches are also the camp staff, which brings with it both advantages and disadvantages. Because of scheduling conflicts, younger counselors have been unable to be involved in camp for the last few years. Only 4 of our counselors were under the age of 25, and they did a great job applying the training material with enthusiasm and energy. It was more difficult for the pastors and their wives. Even so, the kids did not seem to let the age difference bother them. One of the girls gave a touching testimony about how she was a little afraid of her older counselor at the beginning of the week but grew to love her as the week continued. Everyone (especially the counselor) laughed at the way she worded it. That lady and her husband were saved 15 years ago during a Steve Pettit crusade. Some strong advantages of having the pastors involved in the counseling was their knowledge of the Word and the seamless transition of the churches continuing to disciple the young people after camp. 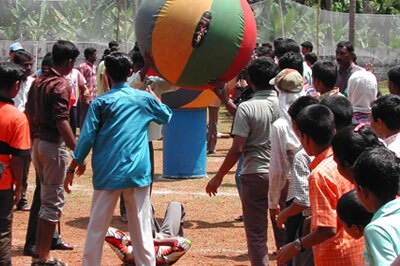 The two national men involved in running the program at camp had not been influenced by a direct contact from CampsAbroad. Both are strong in their ability to direct the program. 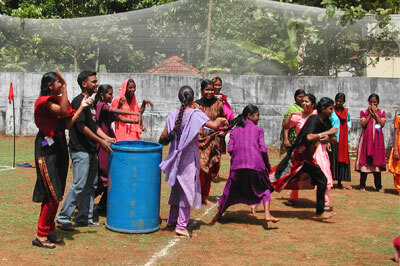 They have good creativity and love to have fun as well. We gave some directing principles, but they already had a strong philosophy in place from the present leadership’s teaching. Camp finished strong. The young people loved the practical preaching of Joel Albright and Kevin Moses. During the testimony time on the last night of camp, many young people gave testimony of decisions they had made. One young lady came to camp with the Hindu dot on her forehead. She said this was the first time she heard of God’s love for her. She got saved and the dot was gone before camp ended! Please pray for her as she returns home to her Hindu family. There were approximately 13 professions of faith and many other decisions about having a stronger walk with the Lord. It was a special blessing to hear that quite a few of the campers committed to be baptized upon returning to their churches. For an Indian believer, visual identification with Christ through baptism is a major step of faith as it is often the issue that causes their family to break off contact with them. 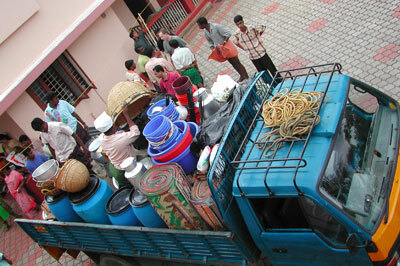 The Lord continues to use camp in this needy country. I reviewed and checked the counselors’ comprehension of last year’s material and was then able to move on to more complex counseling techniques. I am happy to report that they got it! Last year I was uncertain how much information they had absorbed, but this year, through role-playing and feedback, I am confident that most of them know how to use The Wilds counseling models. Several of them told me that they had already been using what we taught them last year to help their church members work through problems. 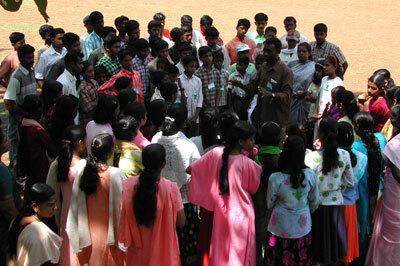 This year the camp was held at a Bible college facility. Brother Thomas bought a one-acre plot of land about a quarter of a mile from the campus, cleared it, put a wall around it and made an incredible ballfield. A large slanted tent was set up against the main building that seated 300 people. We used it for both meetings and eating. This year, 160 campers attended and we were forced to turn away over 50 other potential campers due to the lack of facilities. Next year, a second building will be complete, doubling the housing capacity. Half of the campers had never been to camp, and Brother Thomas estimated that approximately 40% were unsaved – many of them Hindu. They would never be allowed to come to a church, but their parents permitted them to go to camp. Rob Campbell preached a salvation message the first night, and over 20 received Christ. Tuesday night Dr. Fred Moritz preached and another 12 or so were saved. We preached hard on sin on Tuesday and Wednesday and felt a lot of resistance, especially from some of the older guys. The girls were also reluctant to move. I have never been so conscious of the spiritual war that rages around us as I was that week. I suppose it should not surprise me because we were invading one of Satan’s strongholds. We doubled our prayer efforts, and I know many in the States were praying as well. Wednesday was our best day program-wise. The campers loved everything we did. 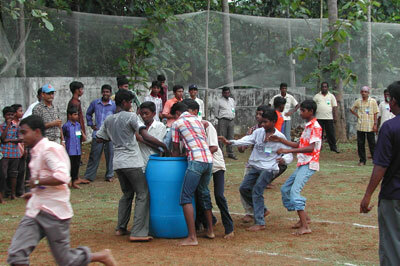 I wish you all could have seen the first Big Ball game played in India. Some of the girls took one look at it and ran the other way. It was a great day for the games, but the worst one for spiritual response – absolutely cold. Thursday night it began to rain during the service. We had distractions everywhere: people talking and leaving the song service, a phone ringing, people on the platform moving around, a lady fainting during the service. But the Lord broke the hearts. Over half of the teens came forward to get sin out of their lives; and for the first time, we sensed a brokenness over sin. Several more individuals were saved. From that point on, there was a different spirit in the camp. 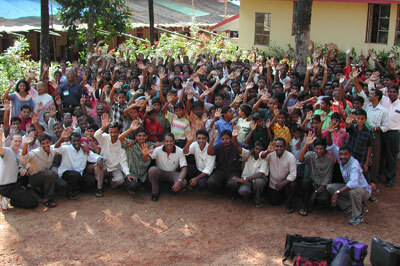 All week the Lord had burdened our hearts to pray for laborers in India. We had a great time all day on Friday and came to the evening service excited about what the Lord was going to do. Five minutes before the beginning of the service, a downpour began. The rain flooded our meeting area with three inches of standing water. We had to move upstairs and pack into a small chapel. We had wall-to-wall people, rain outside, a bad sound system, the biggest bugs I’ve ever seen dive-bombing the campers, plus other distractions. I think it is safe to say that Satan did not want the meeting to take place. But praise God! Greater is He that is in us than He that is in the world. I preached from Exodus 35 about being a willing offering for the Lord, and the Lord called over 70 people into full-time Christian work! What a God we serve! Many others came as well to turn things over to the Lord. We saw God work. The Lord stopped the rain long enough for us to have a campfire service outside before the rain started up again. One of the most exciting events of the trip came on Sunday when we were in one of the churches that had sent about 30 kids to camp. There was a testimony time for the teens who went to camp. Four of the girls that were there were Hindus who had gotten saved at camp and had brought their parents to the service. There were many tears, both from teens and adults, as the young people told what God had done. At the end of the service, 11 adults trusted Christ. By the way, the retention rate in India is almost 100% after baptism because the Christians have nowhere else to turn when their families disown them. Throughout it all, I was able to work with two young national pastors and train them regarding The Wilds philosophy of running a camp–one in the area of program and one in the area of counseling. Next year they should be able to run the camp without us. They are planning two weeks of camp next year. The work will continue! And it has continued: every year, the Lord has provided for unsaved young people to come to camp and every year a number of them receive Christ and enter into the churches–46 in 2003, 35 in 2005. The Lord has His hand on this ministry in a special way. UPDATE: On July 14, 2006, the Lord took Mrs. Sarah Thomas home to heaven. She is greatly missed, but the work continues to go on.